The purpose of the Optimist Club of Milton shall be to develop Optimism as a philosophy of life,to promote an active interest in good government and civic affairs, to inspire respect for just laws, to promote and work for international accord and friendship among all people; to aid and encourage the development of youth and to aid and encourage the development of facilities for the elderly and those with special needs. Optimist International, whose motto is “Friend of Youth”, was formed in 1919 by 11 clubs of which the first local club was formed in Buffalo, N.Y. in 1911. Their goal was to assist primarily young boys in taking the right direction in their lives. At that time the International Motto was “Friend of the Boy” but over the years the leaders of the organization realized that it was not just boys who needed some assistance but all youth, hence the change in the motto to be friends to all youth. With over 120,000 members and 3,800 local Optimist Clubs worldwide, Optimist International makes a positive impact on communities throughout the world. Services supplied by Optimist Clubs is highly personalized and is tailored by each local Club to the needs of it’s community. Funding for an Optimist Club’s projects is generated from within that club’s community so, an Optimist Club is truly a locally based grassroots activity. The Optimist Club of Milton was chartered on January 11, 1967 by members of the Optimist Clubs of Burlington and Oakville with the primary intent of assisting youth in the Milton community. 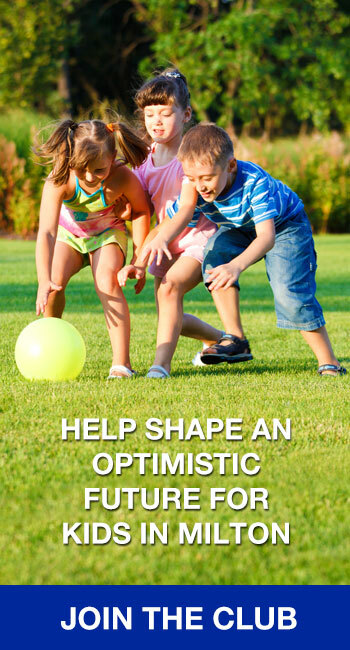 The goal of the Optimist Club of Milton is to conduct or assist with positive service projects aimed primarily at providing a helping hand to youth. At the same time, though, we realize that there are others in the community such as seniors and those with special needs that we cannot ignore. Over the years the Club has donated in excess of $1 million back into the community. In addition, countless tens of thousands of man-hours have been spent by Optimist members at volunteer functions over the years. Some of the major projects that the Optimist Club of Milton has undertaken over the years include donating $100,000. towards the construction of the Milton Leisure Centre beginning the move to make the construction of this facility a reality. In addition the club has donated more than $50,000. over the 40 year history to the Milton District Hospital for programs and equipment primarily related to children and infants. The Club has also purchased the first “SPARKY” used by the Milton Fire Department to help teach children about fire safety and was instrumental, working with the Optimist Club of Oakville, in the re-construction of the Children’s Safety Village located at the Halton Regional Headquarters in Oakville. The Club has also been involved in sponsoring or running many other youth related events yearly throughout the community over these 40+ years including a fishing derby for special needs youth and adults, a soccer skills competition for young soccer players and an essay contest where the winner at our club level can move on for a chance at a scholarship to help further their education. The club has also been involved for a number of years in supplying, free of charge, the breakfast at the Strawberry Fair, the major fundraiser for the Milton District Hospital Volunteers as well as other youth related activities such as a Communications contest for the Deaf and Hard of Hearing and scholarship support for the Milton Music Teachers Association competitions.